Pure co-op is back! Army of TWO The Devil’s Cartel delivers a fun, over-the-top co-op experience. Activate the new Overkill mode to unleash explosive destruction on a lethal Mexican drug cartel. Experience the full action-blockbuster campaign in local split-screen or online co-op! Go back in time and step onto the course with Palmer, Nicklaus, Player, and more legends in their prime. Overtake each star on the biggest stages in the world of golf using equipment and wearing clothing from that era. Eclipse their legacies and cement your seat at the table of legends with Tiger Woods PGA TOUR 14. Journey through a vibrant world full of political intrigue and strife, as you explore perilous dungeons and fight your way through fearsome adversaries! Command the tide of battle by freely switching between different fighting stances in real-time action-packed battles! Customize your character’s appearance and skills to truly personalize your fighting experience! Grab your PlayStation Move motion controllers, step into your own virtual gym and get in shape with over 25 fun, intense exercises and a personal trainer to guide and push you all the way. Embark on a journey through a series of vividly different worlds, featuring multiple challenges with many ways to pass a level and resolve puzzles. Find all the possible ways to get rid of the lethal A-Droids. Highly tactical, completely addictive, A-Men is immediately easy to play and yet hard to master. Welcome to the world of Terraria! DIG, FIGHT, EXPLORE, BUILD! Nothing is impossible in this action-packed sandbox adventure! Over a dozen environments and hundreds of items and enemies! The world is your canvas – make it your own. The official game of the FIA World Rally Championship is back with the most complete Rally simulation ever created. Race through all the 13 official Rallies of 2012 season and become world champion! An award-winning adventure game by Amanita Design, now available for PlayStation Vita. The official game of the FIA World Rally Championship is back with the most complete Rally simulation ever created. Race on 6 official Rallies of 2012 season and become world champion! Pick up this limited time bundle that includes Patapon, Patapon 2, and Patapon 3 for a discounted price! In the SEGA Fight Pack, enjoy three fighting games from legendary developer AM2, each with all-new online modes. Sonic the Fighters: join Sonic and friends in battle in this classic arcade game. Virtua Fighter 2: go back to the roots of 3-D fighting with the second title in AM2’s flagship fighting franchise. Fighting Vipers: choose one of nine zany characters and break your opponent’s armor to maximize damage in this classic arcade title. Join aliens ToeJam and Earl in their adventures across space in classic titles ToeJam & Earl and ToeJam & Earl in Panic on Funkotron! The Knight Edition includes the full game and 13 downloadable items to improve your fighting experience. Journey through a vibrant world full of political intrigue and strife, as you explore perilous dungeons and fight your way through fearsome adversaries! Customize your character’s appearance and skills to truly personalize your fighting experience! This week the PlayStation store is packed with hot games like BioShock Infinite, Tiger Woods PGA Tour 14, Army of Two: Devil’s Cartel and Tales of Graces f. Indie hits Terraria and Machinarium are hitting PSN and PS Vita respectively. If you don’t have the budget for a new release this week, there are sales galore on some of the hottest franchises including Patapon, Sleeping Dogs, Deus Ex, Just Cause, PixelJunk and more! Check it all out below. Try your hand at three exercises – Heavy Bag Targets, Pickup and Cross Punching – with guidance from your own personal trainer. If you enjoy this trial, move on to a full workout with PlayStation Move Fitness. Experience the game of chess like you’ve never seen it before. Download this trial of Pure Chess to see how stunning and beautiful chess can really be, and find out if you are a Grandmaster in the making. No metal gear solid portable ops guess I gotta keep waiting……. Sales, avatars, BioShock, and a Tales game? MAG AND TWISTED METAL FREE FOR PLAYSTATION PLUS PLEASE!!!!!!!!!!!!! Wow, perhaps I am the first? Probably not by the time this is posted, but that’s okay. Not a bad update this week. I don’t have a Vita, so the PS Plus game doesn’t matter to me this week, but the sale looks interesting. I will have to check things out. Now, for my usual question. What are the chances of weekly (or at least occasional) offerings of free themes and avatars for PS Plus? In the beginning, we had new ones every week, usually connected to games releasing that week. Now, we get nothing. It would have been awesome to see a free Bioshock Infinite theme or avatars for Plus. No new PS All-Stars costumes? Well bummer… Not a bad update anyway. Question: Pixeljunk Monsters Deluxe for PS3? That has to be a misprint right? I wish it wasn’t…but I thought it only came out for PSP. You’re right, it is PSP/PS Vita, we are updating that now. Thanks for catching! WHY DOES NARUTO HAVE TO HAVE PAID DLC? I missed the days of the original Storm where we got free missions. Awesome update! Seems like you guys are updating earlier. Keep it up! Having a blast with Bioshock Infinite as i download my purchases, & Sleeping dogs at 24.99$ is surely surprising. What I am still wondering is why there is no ALPHABETICAL SORTING for PSN digital games we have downloaded, yet our trophies have an option to be sorted alphabetically. Are PSN employees seriously so inept, that they are unable to provide us with the option for alphabetical sorting in the XMB? Seems like Sony should fire a bunch of the PSN employees if PSN employees are unable to provide certain necessities such as that. This is a top-requested feature and we are working on improving the download list (as stated by Eric Lempel in the fall), but there’s no ETA. Question though, what happened to the Vita version of A-Men that’s long been released in other regions? BF4 is getting revealed today so how about a MOH:Warfighter sale, especially as it’s being discontinued. btw, Army of Two 3 is by far the worst in the series, stick to the first game if you want a good co-op experience, the 3rd game is just mindless shooting with a partner, every strategic shooter this gen (such as R6 Vegas and Conflict Desert Storm) keeps getting dumbed down to make it nothing but a plain shooter, they’re all mind-numbingly boring now. Also, will the Bioshock Infinite also come with the original Bioshock? If it does, how long will that last? Weird that A-Men was released for Vita in Europe but is PS3 only in North America. Any news on when Hungry Giraffe Vita is coming out? Wasn’t Tales of Graces F supposed to be under $30 (and have a bundle with add-ons), as detailed in Hideo Baba’s post? And…dang it. Was hoping for a free booster pack or something for Hyperdimension Neptunia Victory, but I guess I’ll have to actually try harder (level up, do quests, etc.) to get past most boss fights this time around, unlike other Compile Heart games I’ve played previously…. Those of you who have Plutia/Iris Heart (or any other character new to the Netpunia series) as your avatar, did you get it from the Japanese PSN or something? 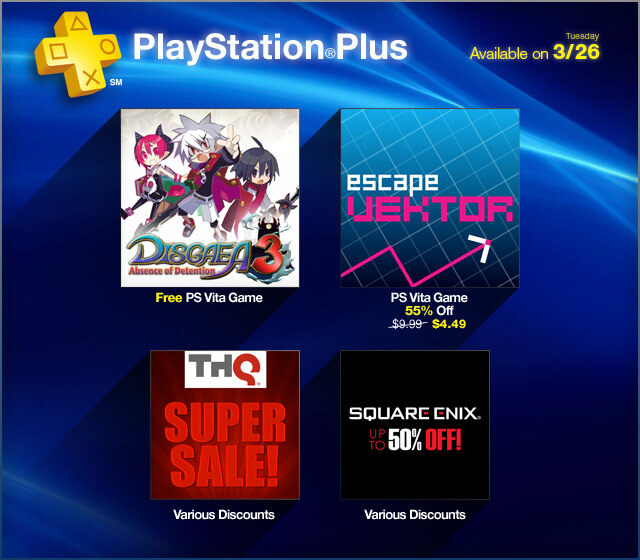 Speaking of NISA…DISGAEA 3, PS PLUS DOODS! Why is A-Men vita version not getting released!!!??? Nice update. It’s good to see the store updated at a decent time. ^_^ So, I was just curious if we’ll ever see Jeanne D’arc (for the psp) on sale? It’s still kind of expensive… that and Siren Blood Curse. Please!!! Would have been nice to see an extra PS+ discount on the full games for Sleeping Dogs or Deus Ex though would be even nicer to see Sleeping Dogs in the IGC next month (seem to recall EU already having had both). Woww nicee update sony. il have to check out those sales. those are the type of sales i likee to see. keep it up Morgan and sony team… wish Terraria was 9.99. good to see an on time update aswell. Sleeping Dogs is on sale. It was not listed as on sale on the original post:) Nice surprise! do you know that horrible feeling when you bought a game a couple of months ago (and you haven’t even played yet!) and then there’s a discount? No Terraria demo or plus discount version is very disappointing. And no Vita version is just plain wrong. Oh well, back to BioShock. Going out on a limb here, but, maybe just maybe they are working on all kinds of features for the PS4. Alphabetic sorting has to be there for purchases. As they get more things done for the PS4, they will probably roll out some of those features for the PS3. If you look at the updates over the past few years, you can tell that a lot of our ‘new’ features were designed for the PS4 and implemented on the PS3 because they could. Have faith, it will be here soon enough, alphabetic sorting on the PS3, that is. As for this update, some of those sales are rather tempting, may look into them. Hoping Morgan can give us a tease of next months PS+ stuff on the Blogcast. Other than a few games for sale, though, nothing for me. Have to go pick up my copy of Bioshock Infinite in a bit, wish you guys would have told us a while back that it would be Day 1 Digital, would have gladly gone that route. PixelJunk Monsters deluxe was made for the PSP and is a PSP game that works fantastic on the Vita, but it is not a Vita game. Surprise Sega Sale. Sonic Racing transformed I’ve been wanting, and now it’s a great price. OMG! So many great sales and discounts. But all I really want to play is Bioshock Infinite. Decisions, decisions. thanks for Bioshock on day one! keep ’em coming! Warriors Orochi 3 for $30? THANK YOU!!! Really no God Of War Ascension WTF!!! Wow, finally you guys decide to add some avatars. And honestly they aren’t even that good… I’m tired of such a big distance in quality between US’ avatars with EU’s and Japan’s avatars. It annoys me as an avatar hunter. As far as games and sales go, they’re wonderful. This week would’ve been 100% perfect if there was more and better avatars. Can’t wait to play Bioshock! Deus Ex for 9.99 is a good deal, might pick that up but first i gotta play this game that’s getting 10’s everywhere! Thats it for Tiger PGA 14? Can you at least let us know if that the additional “14 course pack”, will give those who own TW: PGA 14- Historic Edition, ALL the courses in the game? GOOD LUCK trying to contact EA and getting any kind of answer. Their HELP/Answer seciton is by far, thee ABSOLUTE WORST CUSTOMER SERVICE DEDICATED HELP SECTION IN HISTORY. If you can’t find the answer you are looking for, because they don’t list it, when all else fails, you can’t email them, or call them, but you can TWEET them, or post somehting to FACEBOOK. But even trying that doesnt help. II tried it, i went to FB, sent a TWEET at 10:15am this morning and still NADA.. I bought the HISTORIC Edition which has 5 more courses than the Standard Edition, and just want to know that if buy the 14 course pack , will that give me all the courses available? The PGA Tour has the famous TPC Sawgrass! Now we have ours! I believe you’d also need to purchase Blackwolf Run, Pinehurst & the TPC 4 Pack (Boston, River Highlands, San Antonio, Scottsdale) if you wanted all courses, but that’s just me looking at the list, not an official word or anything. Sorry that you’re having so much trouble! Thanks for the reply. Well, alphabetical sorting should have been a feature on the PS3 since day 1, like 7 years ago. It’s an essential feature of almost all electronic products, and the most common way to sort things. Also, I used to spam these boards with alphabetical sorting comments, and those inept fools at PSN refuse to provide us with being able to sort our purchased PSN digital games by title, alphabetically. WTF????? Sure, Sony are working on other updates, but this alphabetical sorting business should be easy peasy, simple and easy as pie. No excuses for them are good ones. It should have been a day 1 feature. Still no kingdom hearts birth by sleep or final fantasy crisis core. When does the dishonored daud dlc release? Hold the phone a bundle of Toe Jam and Earl 1&2? I must say this is a very large update. It might take all week to wade through the entire list.